Dust quite apparent to the west now, range no longer visible. Wind here eased off a tad for last 5 min. Will make an awesome sunset! Strange that while all Obs for SE Qld are showing high winds, the doppler radar image is only showing a localised area about 30km from the radar centre. The less particles of the right size (e.g. raindrops, etc) there are in the air, the less there is for the radar energy to be reflected back so on sunny days, the doppler wind image often appears pretty sparse compared to days when there's lot of precip or other suitable particles of the right size around. The current wind obs are intersting up this way. Still very much out of the NNE right along the coastal fringe from Point Lookout to Double Island Point. But go a little bit inland and it's anything from WSW (on the Southern end of the coast) and WNW (on the Northen end of the coast). I guess it hasn't pushed right onto the coast just yet, but expected more consistant obs with the strength of this system. The parks and yards here are littered with small tree branches torn off by the wind. Windiest day we have had here in awhile. 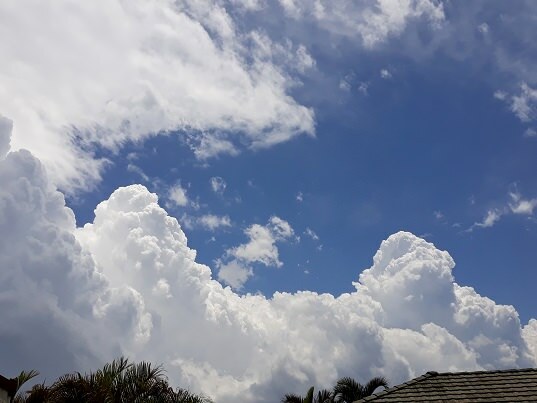 No rain reported this afternoon. What a nasty day, winds gusting close to 70km/h and a max temp of 36C. And now the dust is moving in, looks alot thicker than last fridays dust event. Stuff this, I want what sydney is having!! Can't blame you LightningGus... I'd rather be anywhere than here. Just saw a nice video of a raging waterfall in Katoomba of all places during today's deluge. 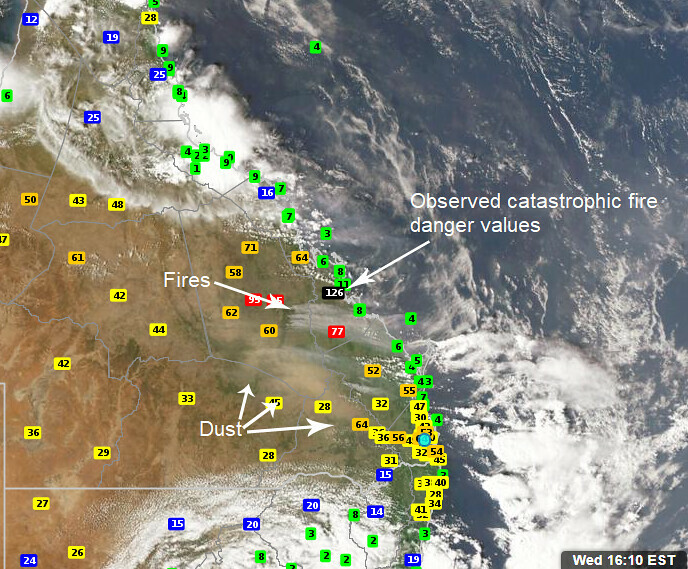 The satellite image via Weatherzone with the currently observed fire dangers pretty much sums it up. ken , has there ever been a higher value in qld than 126? CURRENT TEMPERATURE......33.7C. MAX 35.8C at 1423. CURRENT DEW POINT......... 10C. MAX 25C at 1124. CURRENT WIND DIR/SPEED... W 23KPH. MAX W 54kph at 1501. CURRENT WEATHER...........1/8 cloud - decreasing. Dust Haze. TS 1225 - no hail. Passage of trough 1358. Had a nice storm with some strong gusts and a bit of hail at about 1pm. Dunno how we faired at home yet though I'd imagine it was worse over there. Heard of people not having power too but didn't lose it at work. Disgustingly dry and hazy/dusty out there now. 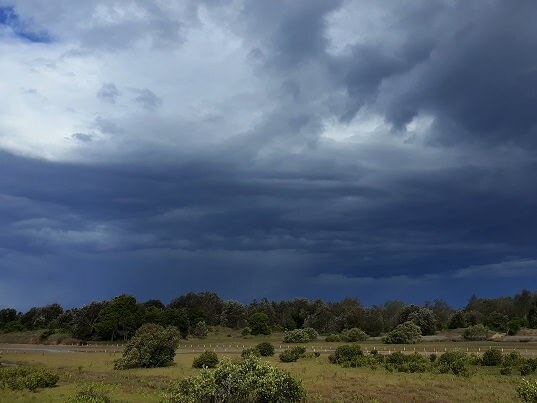 The worst of the wind has passed us, still gusty though, Toowoomba BOM obs peak gust 43kts 2.30pm with gradual lowering. 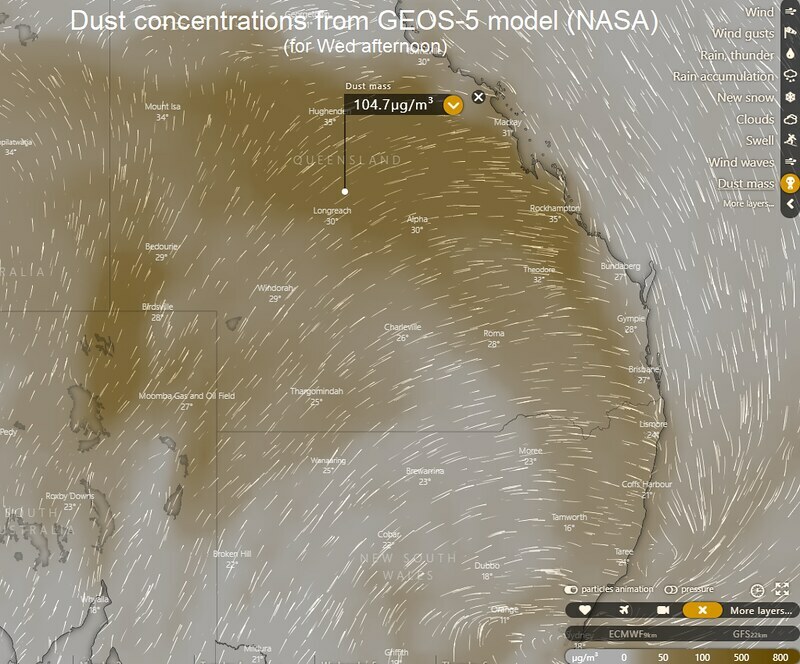 http://satview.bom.gov.au/ Gonna be a dusty evening particularly over northern parts if that reaches the coast. The westerly still hasn't hit here. Cells just skimmed us here, managed to get 1.5mm. What an odd day weather wise, had a low pressure recording of 981hPa, currently sitting at 985hPa. Currently sitting at 32° at nearly 7pm as well. I can't be certain Big T but I'd be surprised if there was in QLD ever since they started to be measured. 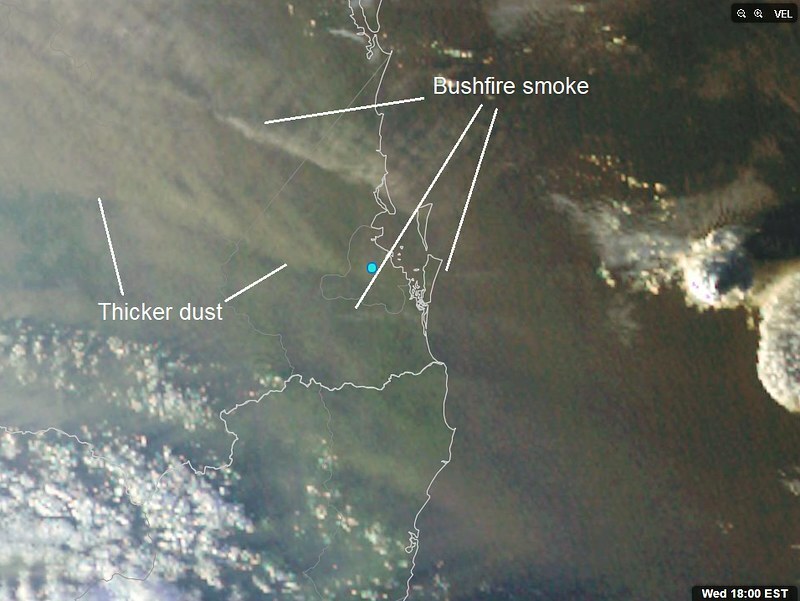 The area of thicker dust was starting to stream down across northern parts of SE QLD as the sun set with another more narrow band moving across areas near the NSW/QLD border. 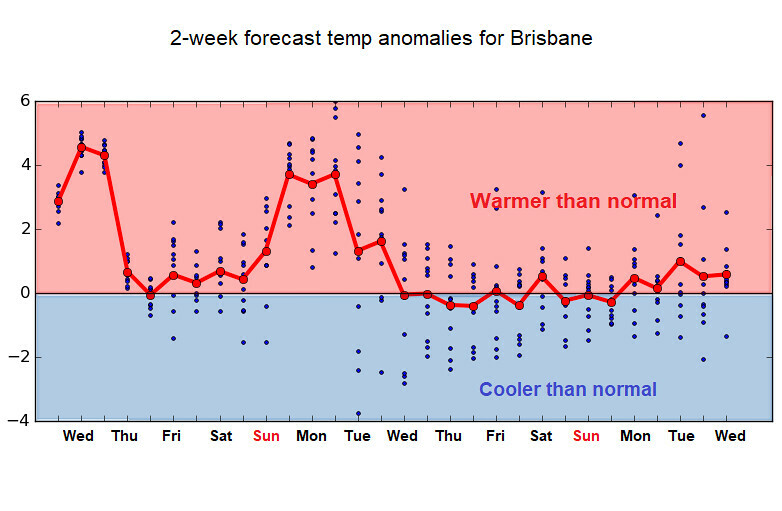 Max temp today soared up to 37.9C in Brisbane today and 38.2C in Archerfield. 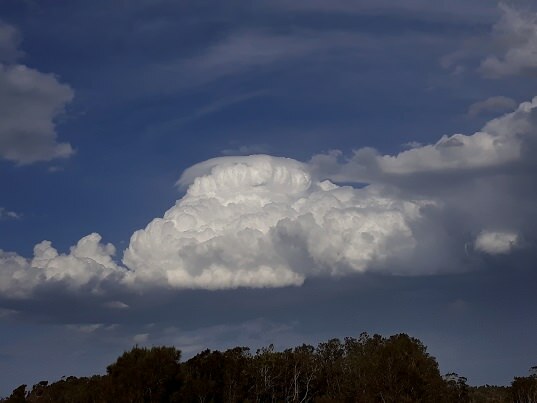 But in complete contrast, Glen Innes had plummeted to 13.7C by 6:30pm EDT and Armidale 11.8C by 3pm. I heard Redcliffe topped the max temp for se area today’? Could be wrong , but if correct, that’s a rare treat for them. 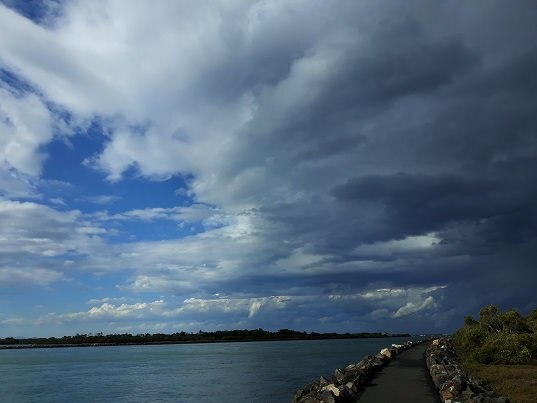 A few pics from today, top photo is from the back end of the storm that went offshore on the Gold coast. That second pic reminds me of Apocalypse Now. 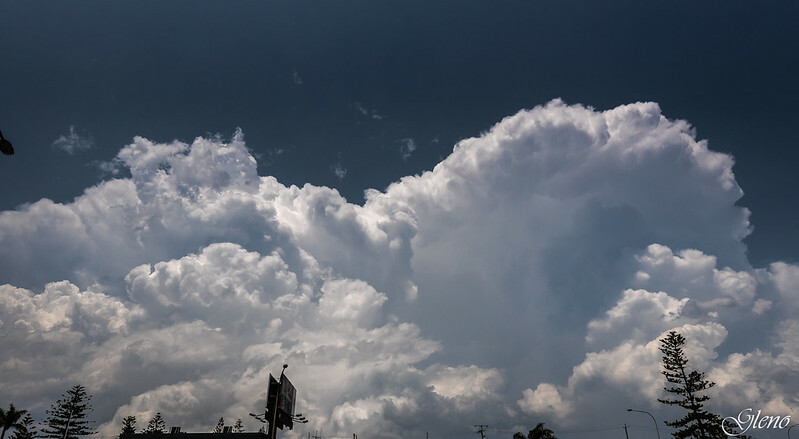 Yesterday, convection formed late in the afternoon. Managed to squeeze 0.2mm out of this high-based shower. 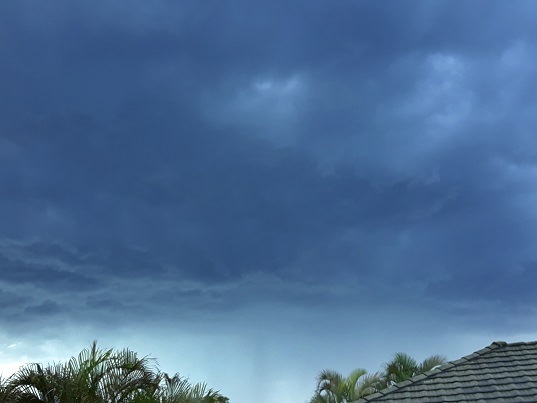 Today, there were three low-precipitating storms which passed through here this afternoon bringing 7.8mm altogether. 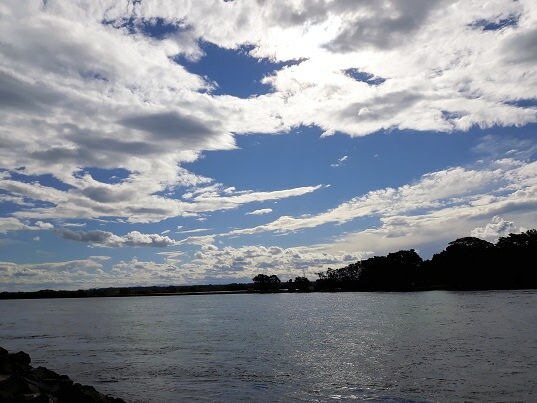 The drier westerlies moved in around 4:45pm after the last storm cleared out to sea. A fairly clear boundary evident between the dry and moister air. 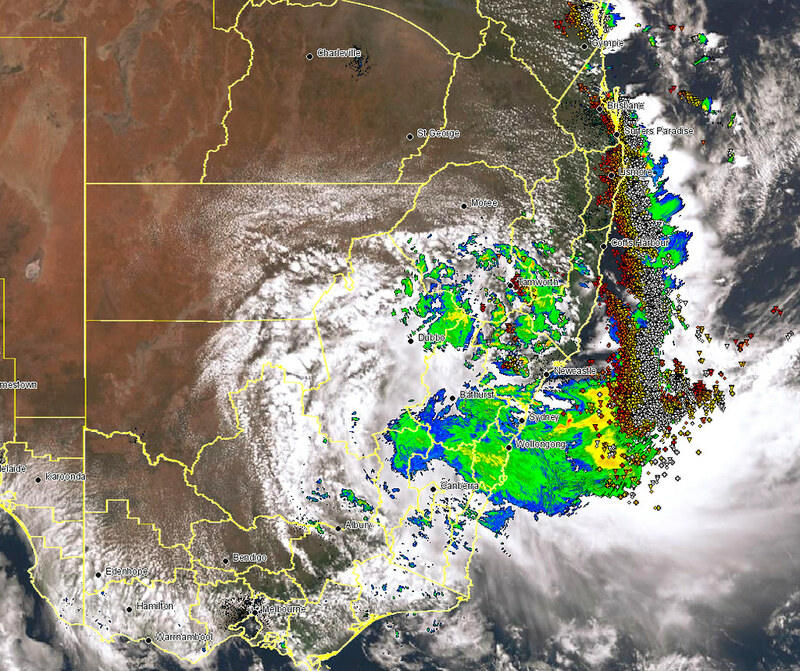 Today's 512km radar loop makes for nice viewing with the low spinning down south and storms growing ahead of the dryline. From what I can gather so far there have been only four houses lost and no serious injuries (a few treated for smoke inhalation) in the bushfires. 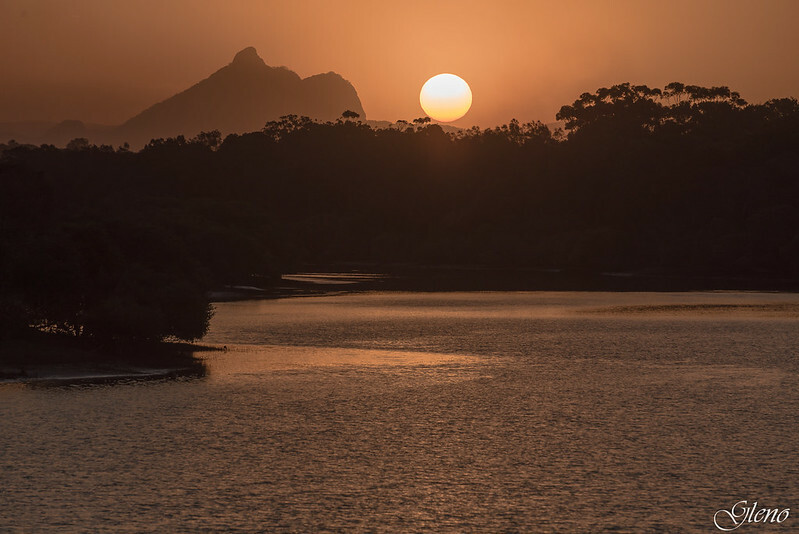 Did we dodge a bullet or were conditions hyped a bit (Only a bit, some very serious bushfires out there but some media comments suggested the possiblity of totally out of control firestorms)? 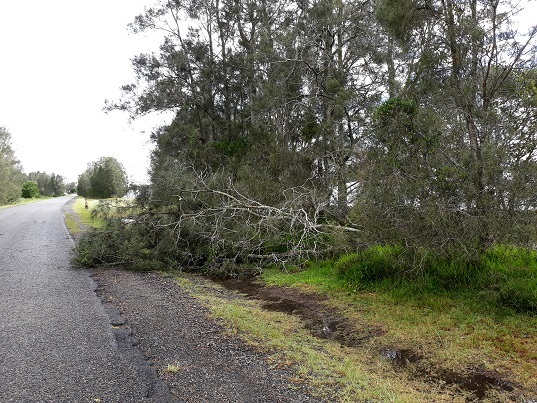 Very hot and dry, but I think the most dangerous winds were limited to southern Qld and perhaps good rains in October have made the difference. The worst bushfires seem to have been further north where they didn't get as much rain in October, but the wind hasn't been as severe. I guess it depends on which specific area of QLD you're referring to. If it's the central region including the Capricornia, etc, no I don't think it was hyped up that much. It's always hard to gauge the true seriousness of fire weather conditions just by looking at the end result in terms of numbers of houses lost, etc. In many cases, various factors such as how much and how effective firefighting resources were, population exposure vs where the fires actually occurred, how many fires managed to start (either through arsonists or other causes), etc have a big effect on the numbers of houses lost and people injured/killed. The fact that 8000 people were evacuated from Gracemere was testament to the seriousness of the situation. The firefighting 737 that was called in up there for support was well warranted. Some of the videos that have been emerging from up that way are quite remarkable too. 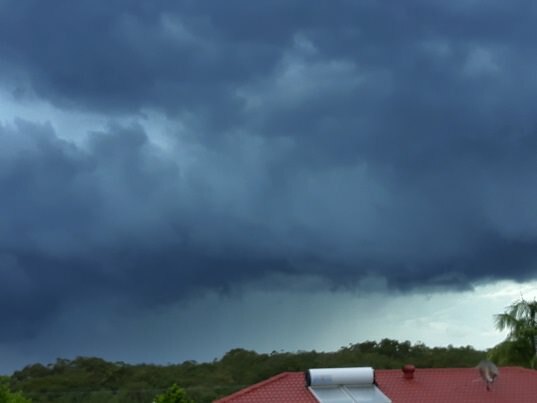 In terms of fire weather, yesterday in central QLD was *extremely* nasty. As mentioned in my previous post, I'm not completely certain but I believe it's the first time in QLD that both forecast and observed fire dangers warranted the upgrade of fire weather warnings up to catastrophic level. It was clearly evident in the realtime FDI obs. It's not just winds that are considered in these warnings (although they tend to be one of the biggest drivers of all in spreading fires) but also the amounts, types and nature of the various fuels as well as dryness of the air. Not as bad down here in SE QLD but fire dangers were still severe and there were still a number of hazardous fires that did break out and were clearly evident on satellite imagery and even radar at one stage. On our flight this morning there was fires/smoke out in the mountains behind Beaudesert and quite a large fire on North Stradbroke so I guess the conditions are potentially there. I did see some comparisons in the media to conditions during the Paradise or 2009 Vic bushfires and talk about unstoppable firestorms. Wikipedia states 2009 had a fire index of 160-200, and the max fire index in in Ken's map was 126 (did it get higher at any stage?). Maybe thats close enough for a comparison to be reasonable without being overly surprised when a similar level of disaster doesn't occur (assuming its the same fire index). Or perhaps I misread the media, can't find anything right now like that. I can't recall all the observed FDI's across the whole region from yesterday's setup off the top of my head but I'd be surprised if any reached the same values as the ones towards the upper end of the range of the 2009 Black Saturday fires in VIC (which were essentially off the charts and phenomenal where even the winds alone were so strong that there were actually a lot of damaging gusts around the place even before the fires got really big... a prolonged dry heatwave leading up to it... and extreme temps). The pre-existing fires in central parts of QLD yesterday also made the problem far worse since the dangerous fire weather could suddenly make these fires jump containment lines and rapidly spread them again. So if you're trying to compare QLD with VIC, it should be remembered that although both events featured extreme FDI values, VIC often gets much higher FDI values than QLD during very favourable fire weather setups. In other words, yesterday's fire weather conditions were exceptional by QLD's standards (and still *very* significant for any state) and those of Black Saturday were exceptional by VIC's as well as Australia's standards. Also remember that Weatherzone's calculations of observed FDI values assume worst case drought factor so I'm assuming they don't explicitly factor in any recent rainfall/vegetation changes. I saw a quote from the QFES commissioner saying the FDI for Rockhampton yesterday was 135, and Emerald was 105. Not sure but fires in Qld are different than SA Vic. Dont think we get those fireballs racing across the top of trees as much. In Qld I think they travel more on the ground making them spread more slowly. I don't know about fireballs, but I do recall one fairly extreme bushfire through state forest in between Caboolture and Caloundra in the 90s I think. Winter, dry and extreme winds similar or maybe stronger than yesterday. Closed the Bruce Highway for a bit and when I drove through a couple days later there were places where the trees had completely burned through the crown. But yeah probably doesn't happen as much up here as it does in SA/Vic. 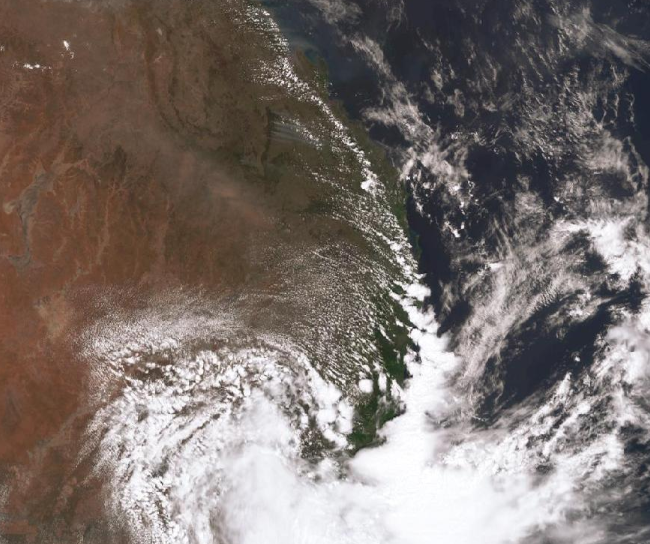 How many people here (living in Qld, not on this forum) have the same 'doesn't happen here' attitude as with tropical cyclones (in Southern Qld). 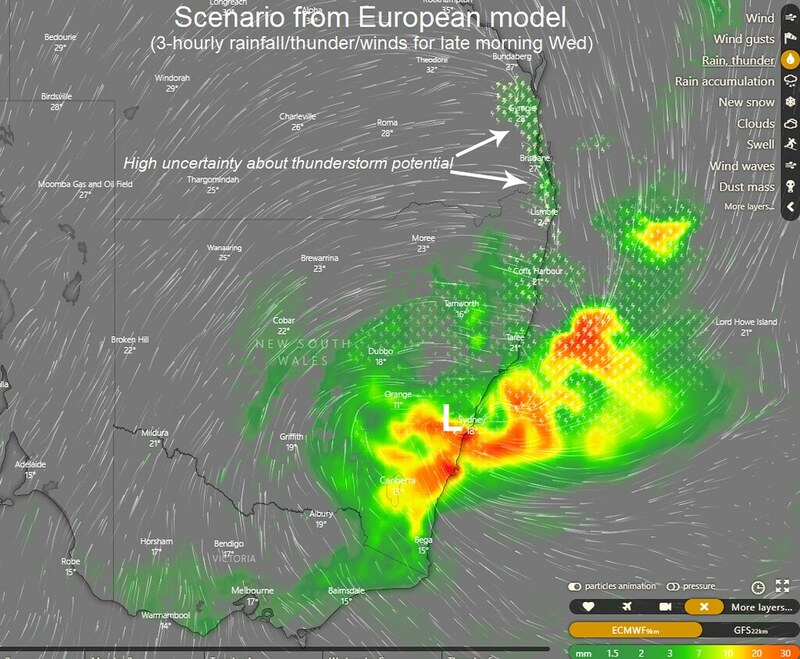 It may not happen for a year, a decade, or even a century... but one day, a high-end TC may well eventually make a direct or near-direct impact on SE QLD/NE NSW with disastrous consequences. Although TC's are far less common in our region compared to up north, some ex-TC's and some low-end TC's have occasionally made it to our region in the past so a high-end one could eventually happen one day and a lot of our infrastructure down here (storm surge into some of the GC canal areas comes to mind too) as well as people may not be adequately prepared for it compared to up north. 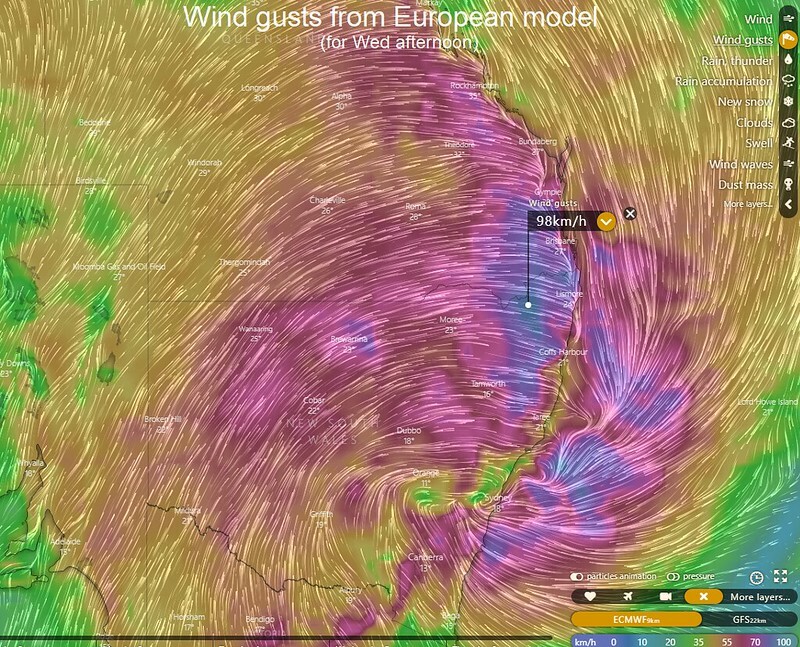 I saw what YASI did to townsville with cat 3 rated winds. Went through Ash Wednesday in Melbourne - Feb 1983. Amazingly although we lived on the eastern side of the Bay, some burning ash made its way across the Bay from the Lorne fires and others closer to Melbourne. I hosed down our roof and next morning a couple of small burnt out areas were noted in our yard. The same embers were believed responsible for starting a couple of the nearby Dandenong Ranges fires. EC deepening the Coral Sea low into TC status now but maintaining a track across CYP.